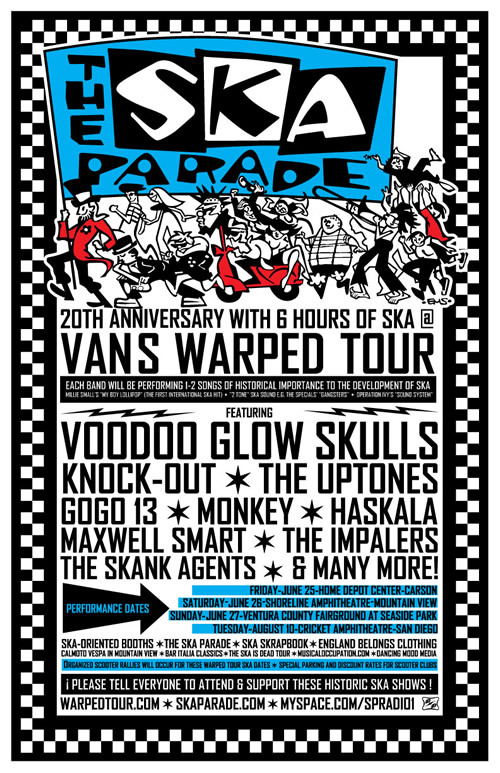 Warped Tour – Ska 4U! For the second year in a row, teh Vans Warped Tour has teamed up with iTunes store to deliver a free promo DL featuring some of the bands playing the tour. This one is heavy on the punk and ska, and that makes this ska doggie happeh! Check it out =) One for USA, and one for Canada. This song is wonderful scary. It makes the same sense now then when Eric Din wrote it in 1983. Here’s a live version from Santa Cruz, just after the band reformed in 2002. Like The Specials, the music is topical and has remained in The Uptones set to this day. The Specials were the next generation after The Skatalites in the Ska calendar. Their song, Ghost Town was a #1 hit in the U.K. in 1981. These guys were styling and political, and they set the tone for the 2Tone movement. They also created the trombone standard that’s been a part of Ska ever since. The Uptones were being dreamed up around 1981-’82, and The Specials were a very big influence. When The Uptones recently reformed, trombonist Jeanne Geiger was their first recruit. You’ll see why at the show. When The Uptones reformed in 2002, everyone told them “Ska was Dead.” The Uptones were needed to help resuscitate this wonderful musical style. Moose wrote this killer song, and Emily Jayne will sing it at the show. Here’s the version that Moose sings. The Uptones welcome their newest member, Emily Jayne. There’s always been some punk in Ska’s recent History. This song has been waiting for Emily and The Uptones Horns. Check out Joan Jett‘s original version. Everybody has experienced that feeling of not belonging. Paul Jackson’s song “Not From Here” is all about that. Here’s the version Paul, Eric, and Ben recorded when they were a 4 piece band waiting to reform The Uptones. Punk, Ska, and Political, this song reflects The Uptones take on the crazy early 1980s. The first Ska band in West Coast at the time, they influenced a lot of the music to follow from Berkeley, California. “Get Out Of My Way” has also been recorded by Rancid. Listen closely and you can hear Tim Armstrong introducing the band at Gilman St. Check out Rancid‘s rad version of this song. Here’s another one of the 2 Tone bands the world should know about, The Selecter. They were popular when The Uptones were forming. Their song “Too Much Pressure” rages with Ska angst. This live version is from “Dance Craze” ~ the definitive documentary on the British Two-Tone ska wave, another key influence on The Uptones. Tazy Philips’ Ska Parade has been promoting and championing ska music and ska bands for two (count ’em!) two whole decades. This ska doggie will be there, celebrating with Voodoo Glow Skulls, The Uptones, Knock-Out, Gogo 13, Monkey, The Impalers, The Skank Agents and more. This event takes place on the Kevin Says Stage @ the Vans Warped Tour in California. Tickets and venue info here. Big poster file here so u can print for yr wall. Buster sez don’t miss!